I knew something special was about to happen when I walked up the stairs to Grace Cathedral. It was nearly dusk when I opened the front door and the majestic setting filled my senses: the stained glass, softly glowing in the evening light; the notes from a trio of musicians filling the nave; and a steady flow of people, pulling me stage left into the world of Lost Childhoods. “Foster Youth Luggage” by Ray Bussolari. 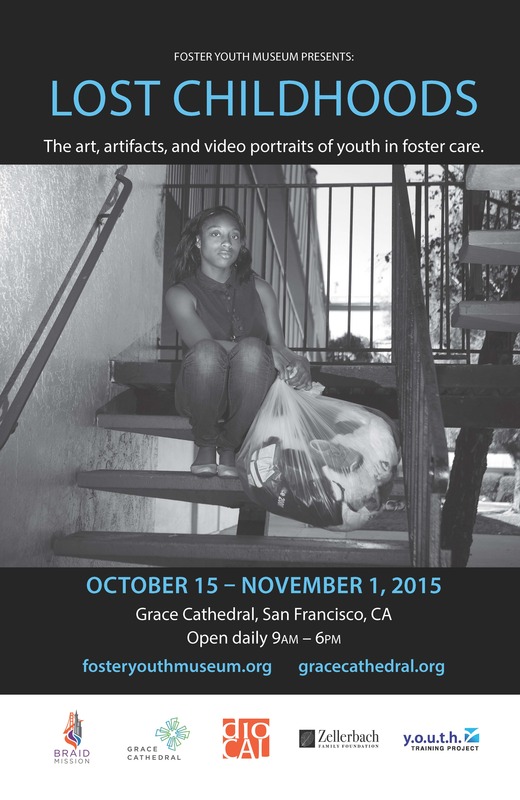 An exhibition of Foster Youth Museum, making its San Francisco debut, Lost Childhoods chronicles youth experiences in foster care. The first of its kind, this traveling exhibition is revealing the voices of foster youth, all too often silenced through the heartaches of loss, and the powerlessness of institutionalization. Upon entering the exhibition, visitors immediately see the impact of foster care, with a display on hygiene products, and a description about the lack thereof in group homes. It is not uncommon for young women to be denied menstruation products and thus use make shift pads stapled together from toilet paper. Likewise, dental floss and other oral hygiene products are absent making foster youth more prone to cavities and compromised oral care. Another exhibit reveals common foods that are served in group homes, where healthy meals are wanting. A blend of large format photos, artifacts from current and former foster youth, art, and video portraits, Foster Youth Museum has become the largest collection of its kind and both youth and the public are taking notice. During an Oakland, CA gallery exhibition, some 2,000 people viewed the exhibit over one month. At the iconic Grace Cathedral in San Francisco, upwards of 6,000 will take part during its two-week run, from October 15 to November, 1, 2015. Admission is free and the church is open daily, 9:00 a.m. to 6:00 p.m.
As I continued through the exhibit, I stopped in front of a black and white photo of Latrenda Leslie holding a clear plastic bag with her belongings. 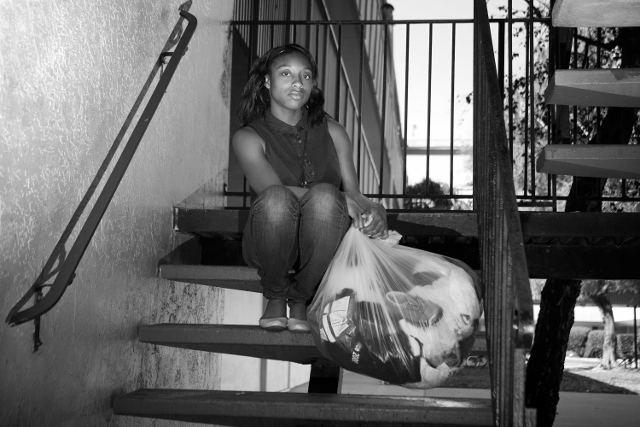 This photo, featured in the exhibition’s promotional materials, tells the story of the infamous “foster youth luggage,” into which foster youth place their scant belongings when moving from placement to placement. When you view the photo, Leslie says she wants you to “think about the instability foster youth experience.” And she wants you to know that youth are strong and carry on, but they need your support. 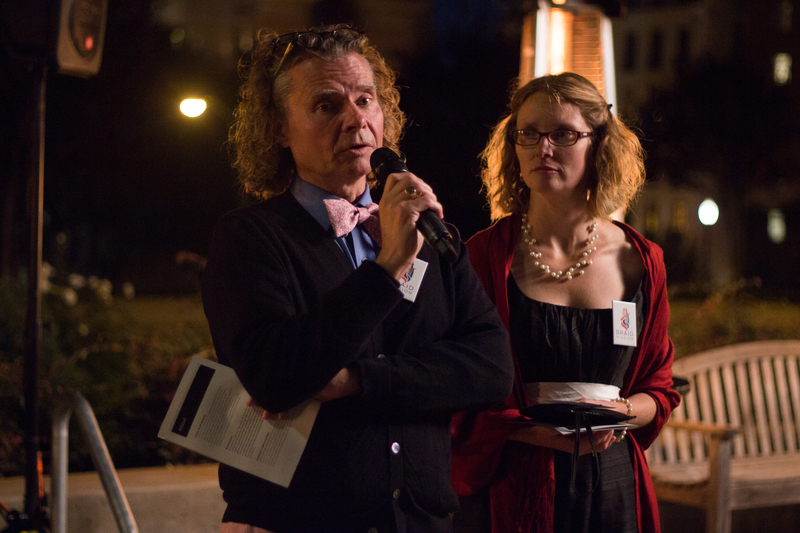 The Reverends Rebecca Edwards and Chris Chase can tell you what happens when you are moved by the intersection of art and advocacy. Co-directors of Braid Mission, exhibition sponsor, Edwards and Chase saw a private exhibition of Foster Youth Museum last year, and as a result, not only changed the direction of their ministry to focus on meeting the needs of foster youth in San Francisco, but in the words of Chase, became “singularly focused on finding the largest stage in the Episcopal Church to expose the powerful stories and art of foster youth.” The historic Grace Cathedral, visited by some 200 people daily, was the obvious choice. As visitors progress through themes of developmental disruption, institutionalization, powerlessness and loss, they arrive at a point of transformation. This part of the exhibition tells youth stories about healing and redemption; after all, the current and former foster youth who share their voices in the museum may have been “lost,” but they are indeed resilient. Education plays prominently in the museum for its role in healing and transformation. There’s a stunning photo of a young woman reading on a marble bench in the foyer of a library, a massive sculpture to her side. One display features diplomas, while another shows colorful graduation stoles. You might wonder why a youth who has so little and has worked so hard would let go of his or her graduation diploma – or any of the objects in the museum for that matter. Put simply, the museum is a vessel for healing. And museum contributors very much want the general public to understand what it means to grow up in foster care, so that members of the community can provide support and connection for foster youth, like Braid Mission was inspired to do with their mentoring program for youth in foster care. If we are to improve the experiences and outcomes for foster youth, we have to look beyond the role of the government and child welfare professionals, to now include the general public. Foster youth live in our communities and our neighborhoods, go to our schools and places of faith, and want what everyone wants – connection, dignity and love. 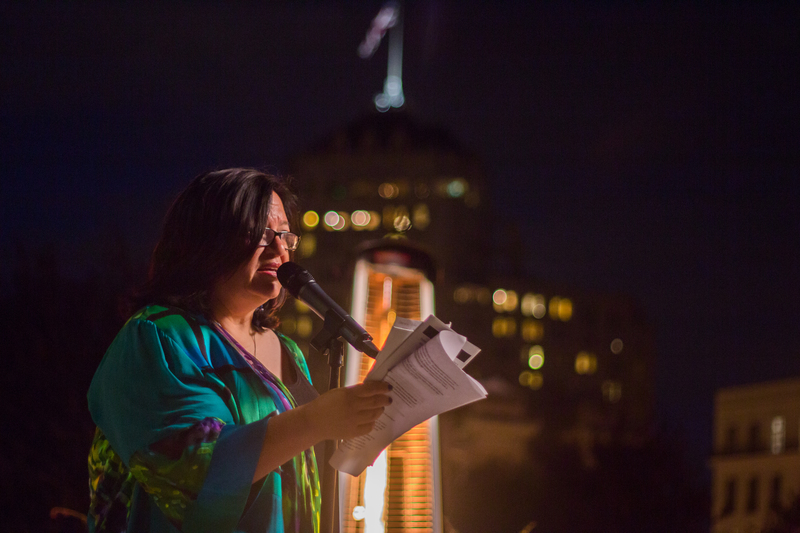 If there is one thing that has moved me repeatedly in working on behalf of foster youth, it has been the notion of permanence – and what it means to have permanent connections in this world of ours. In the face of instability, as youth move from placement to placement, I understand that Foster Youth Museum is coming to represent a permanent home where objects, stories and photos – previously silenced – will be held in a safe repository and shared respectfully. “With community support, we can make this vision a reality so we invite people to support Foster Youth Museum with a donation,” says co-director Evans. The morning after the exhibit, I can still see a large soft purple teddy bear looking up at me from a vitrine. I feel myself tearing up – not because it represents loss but because, in a world of impermanence, it signifies the power of connection and devotion. Annie Gardiner has volunteered with Foster Youth Museum since 2012. Opening Reception: Thursday, October 15, 2015, 6:30 p.m. to 9:30 p.m.
Exhibition Hours: Open daily October 15 – November 1, 2015 from 9:00 a.m. to 6:00 p.m.
Foster Youth Museum makes its San Francisco debut with an exhibition of Lost Childhoods at the iconic Grace Cathedral. Through photos, donated objects, video portraits, and foster youth art, Lost Childhoods documents youth experiences in foster care and tells the story of loss and powerlessness – and the human capacity for resilience and connection. The museum highlights several themes that characterize experiences in foster care, including loss, developmental disruption, institutionalization, and powerlessness. The museum does not stop there, however, and highlights the remarkable stories of perseverance, achievement, and connection. Jamie Lee Evans, co-founder and co-director, says, “Youth experiences in foster care have been silenced for too long, and with the museum, youth are bringing out these silenced stories out so members of the community can appreciate what it means to grow up as a foster youth.” As a traveling exhibition, Lost Childhoods seeds community discussions about how individuals, places of faith and others community members can better meet the needs of foster youth. On Sunday, October 18 at 9:30 a.m., Grace Cathedral will host “Foster Youth Perspectives,” a conversation with The Revs. Chris Chase and Rebecca Edwards of Braid Mission and LaTrenda Leslie and Valentino Luno, two former foster youth and museum contributors. “We believe that the stories, images and artifacts in Lost Childhoods are sacred,” says The Reverend Rebecca Edwards, who is co-founder of Braid Mission, primary exhibition sponsor. “We know the artifacts will be a beacon of inspiration and hope for all who encounter them.” Braid Mission is a spiritual community that brings together the young, entrepreneurial spirit of San Francisco with the needs of youth whose life experience has included the challenge of being in foster care. Foster Youth Museum was conceived by a group of former foster youth who wanted to share their experiences, so people could better understand the needs of foster youth in their community. It is a project of California Youth Connection in Oakland, CA. 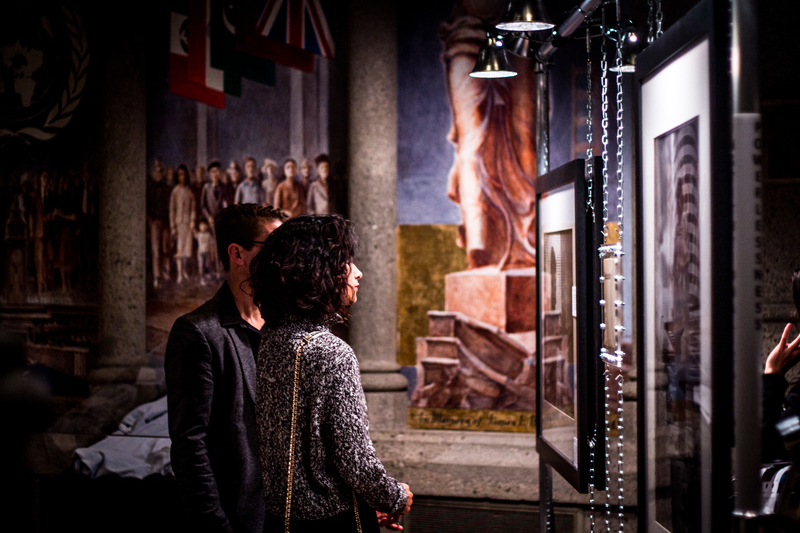 Grace Cathedral is hosting the Foster Youth Museum because it aligns so well with the cathedral’s mission to share the love of God through worship, education, service and the arts. “Art can confront us with a truth about ourselves and our world that we never before recognized, and I think people will be changed when they view the art and artifacts in the Foster Youth Museum,” said the Very Rev. Dr. Malcolm Clemens Young, dean of Grace Cathedral. The Lost Childhoods exhibition also will include a Youth Gathering on Sunday, October 25, 4-5:30 p.m. at which time youth can view the museum, share in conversation, worship with each other and Bishop Marc Andrus, and share dinner. On November 1 at 6 p.m., the museum exhibit will officially close with the Sunday evening Eucharist at the cathedral. In 2012, there were 51,800 children under the age of 18, in California, living in foster care. As of July 2014, there were 5,802 foster youth in the San Francisco Bay Area Approximately 4,000 foster youth “age out” of care each year in California with insufficient housing, support, education, wellness, and resources. Lost Childhoods is curated by Ray Bussolari and a team of exhibition collaborators, all of whom are current or former foster youth. The exhibit features more than 50 items, and is made possible with the generous support of Braid Mission, Grace Cathedral, the Diocese of California, Zellerbach Family Foundation, and Stuart Foundation. The Lost Childhoods exhibition at Grace Cathedral, 1100 California Street, San Francisco, CA, is open daily from 9 a.m. to 6 p.m. Admission is free. 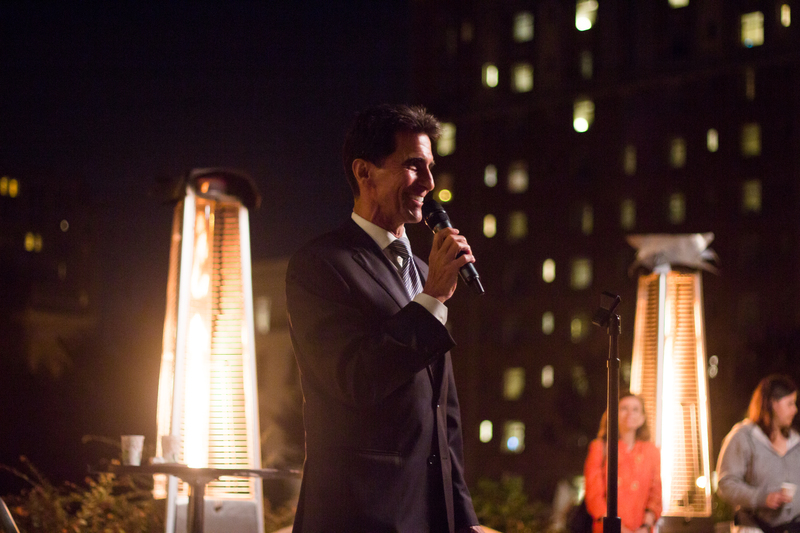 Opening Reception: Thursday, October 15 at 6:30-9:30 p.m.
A celebration to mark the opening of the Lost Childhoods exhibition at Grace Cathedral, including a special viewing of the museum and a short program, with an appearance by Senator Mark Leno. The Revs. Chris Chase and Rebecca Edwards of Braid Mission in conversation with LaTrenda Leslie and Valentino Luna, two former foster youth who contributed to the museum. A special viewing of the museum for youth, with time for conversation and worship with each other and Bishop Marc Andrus. 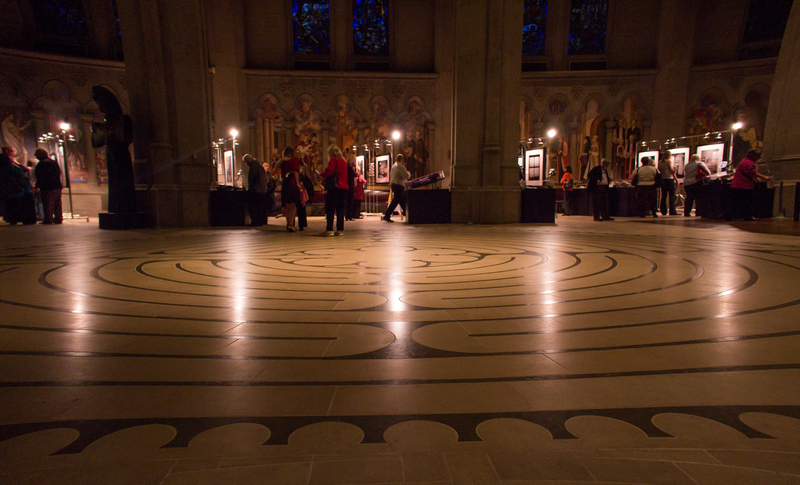 Closing Service: Sunday, November 1 at 6 p.m. – Lost Childhoods exhibition will officially close with the Sunday-evening Eucharist at the cathedral. Foster Youth Museum is a collaboration between current and former foster youth, under the direction of Y.O.U.T.H. Training Project and California Youth Connection. The Museum builds awareness for the foster youth experience, from loss and vulnerability to healing and resilience. By bearing witness to the art, artifacts, voices, and stories of youth who have endured the foster care system, the museum ignites compassion and action so you can be part of transforming youth through supportive and meaningful connection. Lost Childhoods is available for rental at your gallery, event, or convening. For more information, visit fosteryouthmuseum.org. Follow us on http://www.facebook.com/fosteryouthmuseum.org and http://www.twitter.com/FYMuseum to join the conversation about the exhibit. Braid Mission is a spiritual community that brings together the young, entrepreneurial spirit of San Francisco with the needs of youth whose life experience has included the challenge of being in foster care. Braid is a ministry of the Episcopal Church, which has a tradition of commitment to social justice and ethics.